Traffic Jams are a curse to city life. Finally, a startup has found a solution to overcome some of the problems. When I was in Bangalore recently, a city notorious for its atrocious traffic jams, I was pleasantly surprised to see a sign at a traffic signal which told me how much time it would take me to reach the airport. And that’s dynamic data based on traffic situatinos along the route I’m taking. Now, that’s useful information, I thought. I wondered who is behind this and I finally found out. Mapunity Information Services has partnered with the Bangalore City Police and Airtel Karnataka, the city’s largest mobile operator, to provide a comprehensive urban traffic information system for Bangalore city. With BTIS, real-time traffic information is deduced from the cell phone tower logs of Airtel’s city-wide network, and made available to commuters to see live congestion hotspots, find directions and plan their travel routes. The entire information system is available through SMS to Airtel customers using a shortcode, and to others by dialling a ten-digit number. During the next few weeks, the system will remain free to users, while the product is rolled out to cover all neighbourhoods. This live traffic information system is the first of its kind in India. It addresses the growing need of traffic administrators for centralized traffic monitoring and control infrastructure. Mapunity was cofounded by three persons, Ashwin Mahesh,an atmospheric scientist, D Alagesa Pandian, a botanist and B V Pradeep, an engineer. Ashwin is a consultant for the Second Administrative Reforms Commission, Govt of India. He was earlier Director of GIS, Egovernments Foundation, Bangalore. Ashwin holds a Ph. D. from University of Washington in Geophysics and an M.S. from Vanderbilt University in Astronomy. A while ago, Monster India was the first job site to launch a Video Resume service. In this episode, you’ll hear an interview with Vikas Agarwal, vice president of product & technology at Monster India, the key guy behind the new video service. 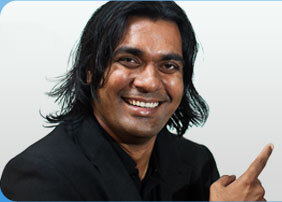 Vikas manages the team that launched the new site, which won the Best Indian Job Site Award from PC World. MCA by education, Vikas started his career with Wipro before working with Hughes Software to develop GSM protocols for Mobile satellite communication. SJ Klein is director of content at the One Laptop Per Child project. The vision of the project is to provide children around the world with new opportunities to explore, experiment and express themselves. And one such way is through a very inexpensive yet rugged laptop. OLPC is the brainchild of Nicholas Negroponte, from the MIT Media Lab. Samuel Klein has spent many years developing collaborative communities. He is an advocate for free universal access to knowledge and tools, and a veteran Wikipedian. He organizined the international Wikimedia conference in Cambridge. Previously he has worked to develop software and supporting communities for machine-assisted human translation, and to set up free education centers. Klein is interested in local and sustainable knowledge development. He establishes ties with teachers, game developers, and publishers, helping them to understand the need and uses for free and open materials. He is passionate about working with the global community around open education. In this podcast, SJ talks about the OLPC program and about the laptop itself.